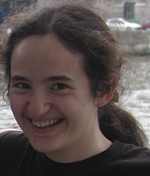 Rachel's research is in the area of bioinformatics. Working largely independently, she developed a novel system for Gene Ontology analysis, search and exploration. She is the lead author of a paper on this research that has been published in BMC Bioinformatics (one of the main journals in the field). Her paper received stellar reviews and a lot of attention in the field, and her system is being used by biology researchers in many institutions.